One of the side effects of working on many projects is that they may all get finished at about the same time. That's it for now. Work has been slow, and I'm the boss, so I've had more knitting time at work. The Mystery socks were stash busters., using little balls of left overs. 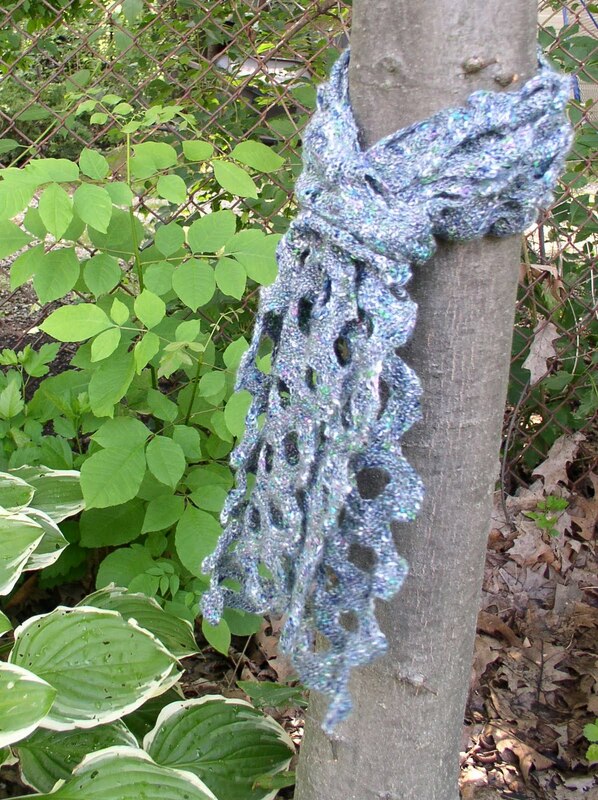 The swiss cheese scarf is cone yarn from a mill. I like it so much that I have started a sweater from the rest of the yarn. It is top down. all available yarn will be used and there are so many colors ot tweedy bits in it, that I can choose another color for finishing if needed. Last Saturday was a guild yarn shop hop. We went to Columbus, OH, about 3 hrs south of us. We did have to meet up at 6:15 AM. I didn't drive, so was able to knit.I chose a simple scarf that had been sitting for over 6 months. 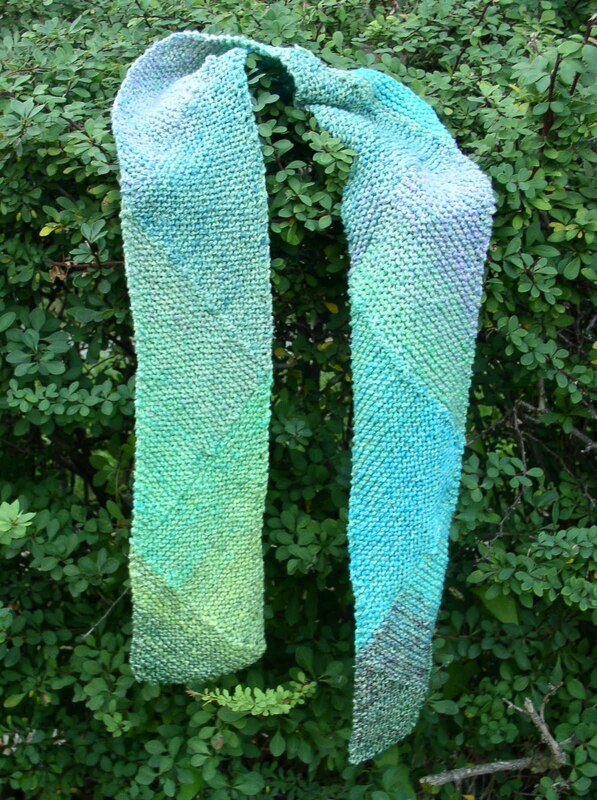 It is the Multidirectional Diagonal Scarf, knit from 2 balls of Noro Matsuri that I received as a holiday gift. On the trip, needles, sock yarn, a pattern, and a sock yarn needle gauge were purchased. Much fun was had. Today is family day picnic gathering. DD #1 is in town from Florida. I gave her a book on historic American quilts, since that is her main hobby. She loved it. 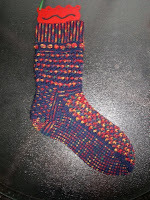 Present sock on the needles is Lucy Neatby's Fiesta Feet, knit from Patons Kroy 4 ply sock yarn. 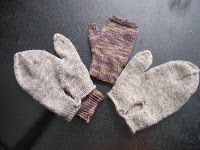 Plan A was to use muslin as the solid, but it was knit into something else and is not available. Norfolk blue was substituted. Kroy is heavier/denser that many sock yarns, so I stuck with the same brand. Boy is this a lot of work! 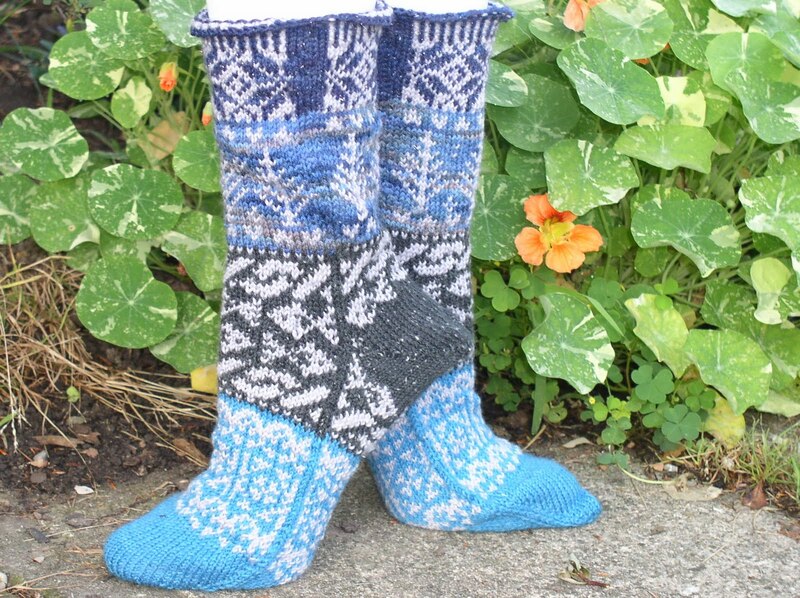 I made the leg longer, because I like winter socks to meet my long underwear. Nothing worse than a gap for the cold air to find. I've waited years to knit these. When I finally got to it, I couldn't find the pattern and had to buy a new copy. That wasn't so bad, as the first one was a copy a friend gave me. From her complaints, I thought she was sending me her original. 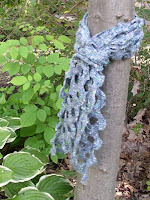 When I used the muslin yarn, it was still available for repurchase. Oh Well. 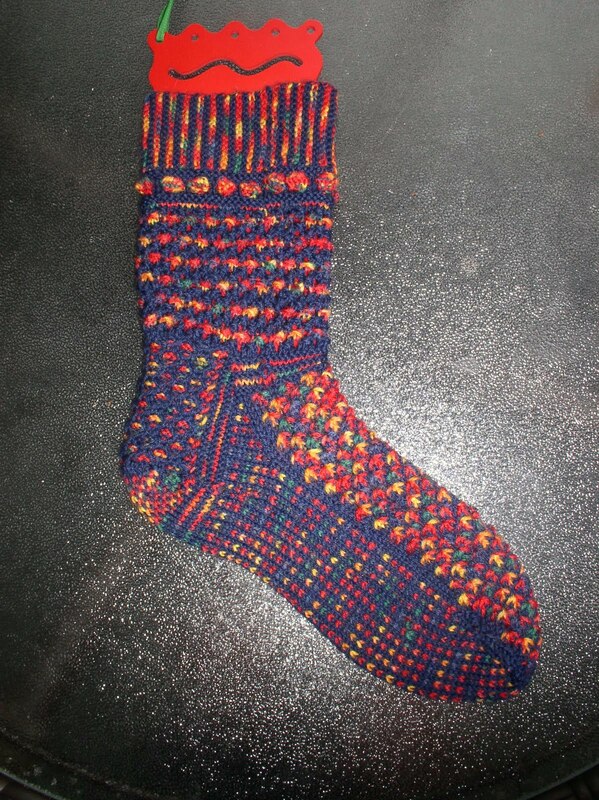 First sock is finished. Keep knitting! Quick cast on - a fruit hat for grandson to be born in Sept. Stash yarn says he gets an apple. I bought a fruit phat pattern on the shop hop, thinking I only had the flower hat pattern. WRONG! I can't find a flower hat pattern, but already had the fruit hat. DD #1 was happy to take one of them off my hands. I should finish the hat tonight, started about 4:00 this afternoon. It was easy knitting at the party, round and round and round.